The integration of subspecialty expertise in the management of critically ill patients has become an area of both great interest and controversy. The past several decades have seen the emergence and rapid implementation of such subspecialty intensive care settings as the cardiac intensive care unit (ICU) and the neuroscience ICU. By pooling individuals with similar disease processes, and capitalizing on the expertise of specially trained nurses and physicians, many believe these units can provide more efficient and effective critical care delivery. Despite limited evidence to either support or refute their significance, these ICUs have become more commonplace, and their proliferation has brought to light important questions regarding optimal structure, staffing, and training. At the same time, the role of subspecialty consultants for an increasingly complex critical care population remains an important and evolving process. Neurocritical care society education and training. 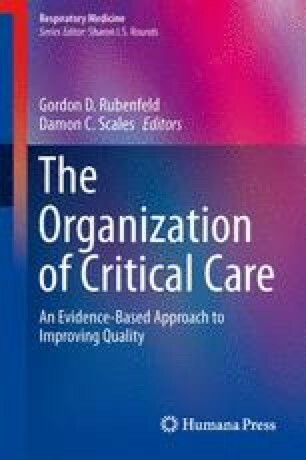 http://www.neurocriticalcare.org/i4a/pages/index.cfm?pageid=3345. Accessed 26 Apr 2012. European Board for the Specialty of Cardiology. Curriculum for acute cardiac care subspecialty training in Europe. www.escardio.org/communities/working-groups/acute-cardiac-care/documents/esc-curriculum-training-intensive-acc-europe.pdf. Accessed 16 Apr 2012.